This beautiful dining room was opened by restaurateur Aleksander Rappaport at the start of 2017 on the first floor of the historic Hotel National, which also houses Dr Zhivago. 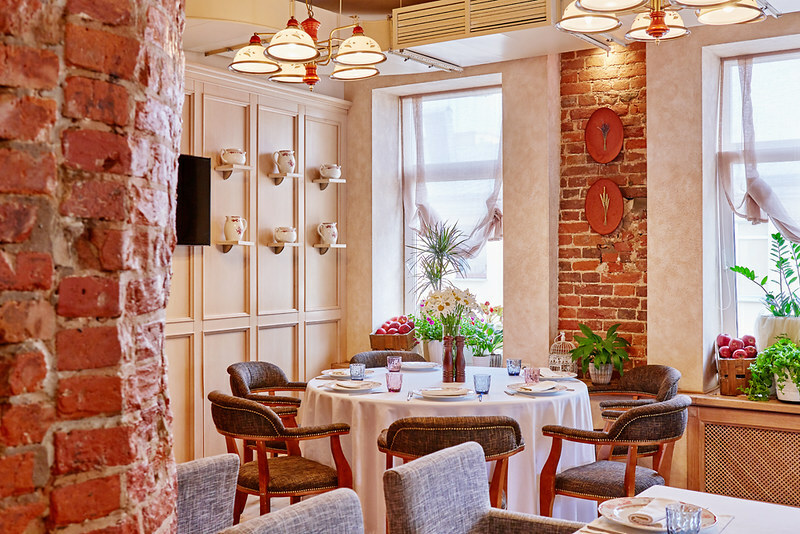 It has the most extensive menu of caviar in the city including Beluga (hence the name), Ossetra, Sevruga and Sterlet, as well as Russian and international-style dishes. The design by Anastasia Panibratova derives some inspiration from the Swan Lake story, specifically the Swan Princess as depicted on the canvas of Mikhail VrubeI. It’s a beautiful space, with a bar counter in the shape of a giant crystal caviar dish. 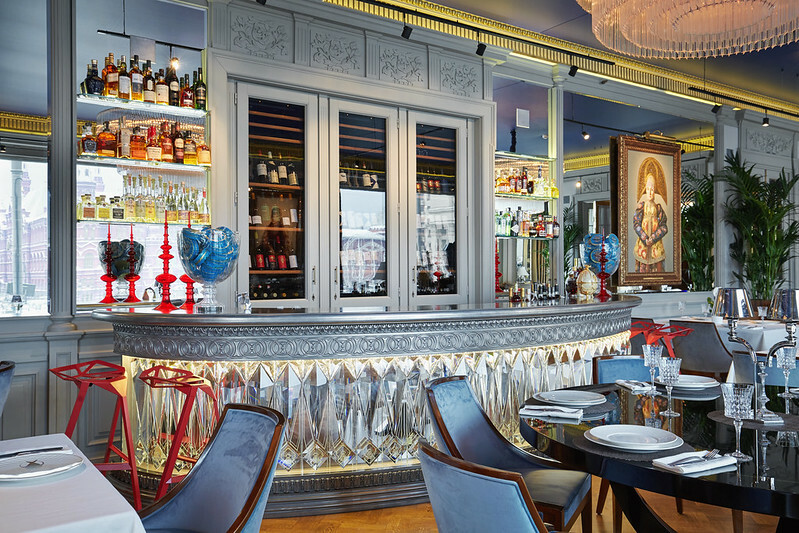 There are crystal chandeliers in front of a mirror at one end of the dining room which has a clever plastic mesh artwork of Russian models in kokoshniks (Russian headdresses) taking selfies. Делимся хорошими новостями, друзья! Работы арт-группы Recycle @recycleart, создавшей специально для нашего ресторана панно с русскими красавицами в кокошниках, делающих селфи, теперь можно будет увидеть и на главной музейной площадке Москвы — уже скоро, 21 июня, в ГМИИ им. А.С. Пушкина @theartsmuseum дуэт представит выставку-интервенцию из 12 инсталляций. Выставка продлится до 20 августа, и её уже называют одним из главных культурных событий этого лета?? . #ресторанбелуга #ресторанbeluga #belugarest #belugamoscow #beluga #recycleartgroup #recycleart #recyclegroup #modernart #artwork #installation #art #contemporaryart #instafood #bestrest #resto #moscow #rappoportrestaurant . Всё о жизни «Ресторанов Раппопорта» — в одном аккаунте @rappoport.restaurant ? Подписывайтесь! Start with a tasting of types of caviar perhaps, or maybe Sosva Lake fish with anchovy mousse (rubles 650); perhaps followed by a main course of salt-baked sturgeon with Abkhaz lemons and thyme (rubles 1,600), or stewed lambs’ tongues with bulgur wheat (rubles 920). If you’re travelling with your family or simply want a relaxing meal but with excellent food, Seven is the place. The menu has combines dishes from Russian, European and Asian cuisines in a friendly format, meaning even the fussiest of children will be happy. From the grill you can try Astrakhan sturgeon (rubles 1,100), or chicken breast Romano with mayo (rubles 490); Asian dishes include half a Rostov duck with hoisin sauce (rubles 890). The two floors of the restaurant have been designed by architectural studio DBA-group under the guidance of the management company Restokrat, with wood, concrete, blackened metal parts, glass pendants and lots of greenery. Situated in the Kempinski Hotel, Café Kranzler is a name common to several Kempinskis including Berlin. This one is styled after a European Grand Café dating from the late nineteenth century, successfully disguising its modernity (it was refurbished only last year). You can eat sophisticated mittel-European dishes here (Wiener schnitzel or beef stroganoff), but also more modern takes such as a three-deck caviar starter (served with three different vodkas), or pasta ‘Kamchatka’ – orecchiette pasta with Kamchatka crab (Alaskan king crab), lemon and salmon roe (rubles 1,600). A dessert of Russian blinis with berries, sweetened sour cream and vanilla ice-cream (rubles 500) is suitably calorific. Georgian cuisine is arguably the most sophisticated and interesting of all the former Soviet options in Moscow. Restaurateur Andrey Dellos champions Georgian food here with a Georgian mother and son team in the kitchen. The design of this two-storey restaurant is also a triumph (check out the photos below on the Flickr carousel). The top floor has aged ceilings, columns and a plenty of greenery as well as a terrace with seating for 150 guests with a view to the Moskva River and the Radisson Royal Hotel. Try a starter of khinkali kalakuri, steamed dumplings filled with pork and veal (rubles 100); while mains include options of Megrelian khachapuri, a flatbread filled and topped with contrasting cheeses (rubles 590); or Black Sea perch with jonjoli, the brine-pickled flowers of a Georgian shrub (rubles 980). Mother and son chefs keep an eye on proceedings. 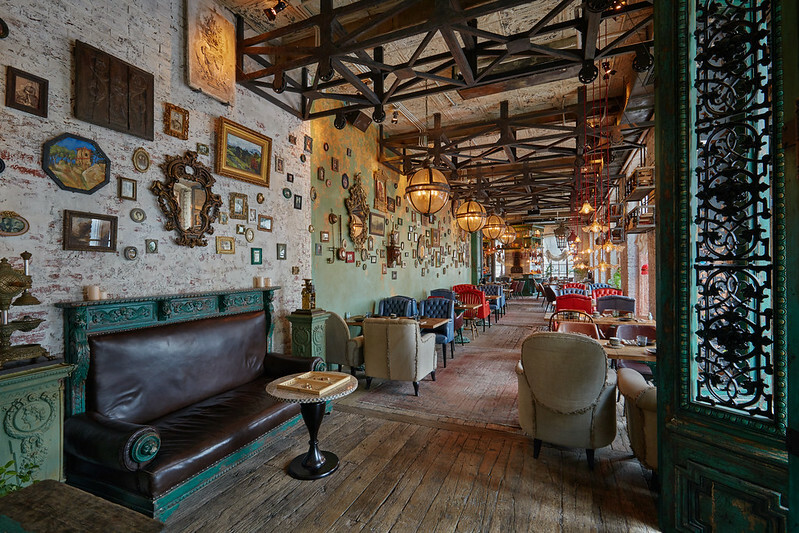 Translating as “Honest Kitchen”, this is a modern Russian restaurant by chef Sergey Eroshenko. It succeeds in feeling like the kitchen of a country house – unpretentious, with a tiled Russian tiled stove in one corner upstairs, and with simple wooden tables. Sample dishes include Siberian river fish soup served with vorschmack (a salty pâté) on rye bread (rubles 590; Dagestan lamb loin kebab, marinated in herbs (rubles 920); or whole Volga starlet (a type of sturgeon), smoked in a Russian wood stove (rubles 1,450).